The Reading Radsport Festival returns for a second year in 2018 with the support of a new Presenting Sponsor in Tower Health-UPMC Health Plan. Further support is provided by returning sponsors Edwin Barbey Charitable Trust and Penn National Gaming again along with Customer’s Bank, Penske, Equus Capital Partners, Reading Eagle Company, WEEU and Pretzel City Productions. These sponsors are now joined by EnerSys and Fromuth Tennis as new sponsors in 2018. Thanks to Tower Health-UPMC Health Plan along with the support of many other sponsors the Reading Radsport Festival will be even bigger and better than the one held last year, which drew hundreds of bike racers and thousands of spectators. The two-day festival brought top cycling talent to the area from all over the North East as well as the rest of the country, showcasing the Reading and West Reading communities as well as benefiting the Reading Recreation Commission. “Tower Health-UPMC Health Plan is proud to be the Presenting Sponsor of the 2018 Radsport Festival. We are committed to advancing health in Berks County and the surrounding communities. The Radsport festivities showcase the importance of living a healthy lifestyle and engaging in physical activity. We look forward to welcoming competitors, spectators and the community at large to the fun-filled weekend in West Reading and at City Park in Reading” said Clint Matthews, Tower Health and Reading Hospital President and CEO. Race director Kacey Lloyd says the event, scheduled for August 4th and 5th, “Will again deliver a full weekend of racing in West Reading and Reading while raising the high bar set last September”. This year’s move from a September race to August was in direct response to feedback from local businesses looking to get more people to their shops at a slower time of the year. Saturday’s events have also been moved up a few hours, so spectators can more easily enjoy not only the racing but the bars and restaurants in West Reading following the races. New this year is the addition of the 5k run and 5k relay opening up participation to another sector of the Reading community. Sunday will now host the Mt. Penn Hill Climb with expanded categories to give more local cyclists a chance at testing themselves up Duryea Drive or on the new City Park Dirt Course. Music in the park and parties along the climb will once again accompany the event, making it a full day of entertainment. The race is both an important up-and-coming race and regional event to showcase Reading area as a cycling and outdoor enthusiast destination. New this year will be the City Park Dirt Course, which will consist of a course that involves pavement, grass and optional obstacles – designed to create an offering for off-road cyclists to participate and also as a way to bring more cycling into City Park. The fun doesn’t stop there — a beer garden in City Park with a view of both the Bandshell and the Dirt Course as well as fun kids activities like the free bubble festival taking place on-site means there is something for everyone! Saturday, August 4th, West Reading will host the 2nd annual West Reading Criterium around a technical 0.8 mile circuit. Racing will start at noon with the Women’s Pro race at 5pm and the Men’s event to follow. The inaugural event brought 150 professional racers from 26 states and nine countries; 120 amateurs from six states; and 45 kids and teens from throughout Berks County to West Reading. 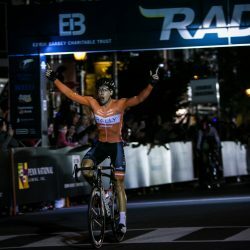 Local Berks County resident Shane Kline of Rally Pro Cycling won the men’s criterium in front of thousands of spectators. Australian Lauretta Hanson of UnitedHealthcare Pro Cycling won the women’s event. The schedule for 2018 sees two major changes. First, the action kicks off slightly earlier in the evening to take advantage of the local West Reading restaurants and businesses being open longer for post-race festivities. Second, we have added 5k running races to our program to further broaden the event’s reach. Street Sprints kick off the events at noon followed by amateur racing, 5k run and relay and exhibition events featuring talented local Reading area kids. The professional women will race at 5pm with the men following them shortly after. “We learned a lot from the businesses in West Reading and will be making a few schedule changes to better suit the local community,” says race director Kacey Lloyd. By concluding at dusk, local businesses will be able to serve food while their kitchens are still open. A 2017 race report can be found here. The Mt. Penn Hill Climb in Reading will move to Sunday in 2018 with racing starting at 11am. “Moving to Sunday allows us to offer more time for citizens who want to participate in the Radsport Festival,” says Lloyd. The race course will return to the iconic Duryea Drive, following the same start-finish locations as the car race. In 2017, Australian Stephen Hall won the professional men’s field in 7:19, and Canadian Emily Spence won the women’s field in 9:24. There are many new offerings at City Park for 2018. First, there will be separate citizen and amateur fields. Splitting these fields offers more chances for local riders to get on the top step in the citizen’s category. Second, an Uphill Dash running race to the Pagoda has been added for anyone who wishes to give it a try. Finally, the City Park Dirt Course will be the biggest addition of the 2018 Festival, wrapping around the Bandshell and a festival area offering racing views from multiple angles. The City Park Dirt Course will also be used for a Kid’s Fun Run around 11:50am before the Dirt Course cycling events kick off at 12:45pm with a Junior Short Track MTB race followed by Open Cyclocross, Women’s Short Track MTB and Men’s Short Track MTB. While racing is happening, City Park in Reading will host an afternoon of music, food, and beer similar to 2017’s evening in the park, but with the addition of off-road racing for some extra entertainment. The Reading area has a lot to offer, which the Radsport Festival will help display. “The Greater Reading Trails System, which has received a distinguished “Bronze” designation by the International Mountain Bike Association, consists of more than 125 miles of trails in five major land preserves, all of which can be accessed via the Schuylkill River Greenway Rail Trail. The community is very cycling friendly and boasts a number of great restaurants, micro-brew pubs, and reasonably priced hotels for cyclists,” says Eric Schippers. Festival organizers hope spectators and athletes will stay in the area after the Radsport Festival in anticipation of the following weekend’s USA Crits feature in West Chester, PA.
Prize money will include equal payouts for men and women. Amateur categories will race for primes – or prize distributed throughout the race with the goal of creating a more exciting and animated race for the crowds. The 2018 Reading Radsport Festival will see a new presenting sponsor in Tower Health-UPMC Health Plan. Other top-level sponsors include Edwin Barbey Charitable Trust, Penn National Gaming, Customer’s Bank, EnerSys, Fromuth Tennis, Penske, Equus Capital Partners, Reading Eagle Company, WEEU and Pretzel City Productions. The event is also supported by a number of other local contributors who can all be found on the event website at www.readingradsport.com. Sponsorships for the Radsport Festival benefit the Reading Recreation Commission’s mission to provide meals to over 80,000 people in the Greater Reading Area. Reading Recreation Commission was named Pennsylvania’s 2017 Agency of the Year. The 2017 race raised partial funds to go toward the installation of a walk-in refrigerator. Sponsorship inquiries can be directed to the email below.